Today I’m happy to feature a guest post by Rachel of Little Scratch. Rachel is a Year 3/4 teacher and team leader at Donvale Christian College in Melbourne, Australia. One of her favorite things is listening to her students and being amazed at their perceptiveness. Read about her teaching adventures at littlescratch.com.au. Like me, you might have seen it done well – handing out points for good behavior with which students can later redeem privileges like free time, computer access or the chance to ‘buy’ from the prize shop. You might have also heard gentle promises such as ‘If you work quietly, we can play a game later.’ Strategies like these have merits. I’ve tried a few, modifying here and there to make it easier and more effective. With each one, however, I always felt there was something not quite right. I felt uneasy and uncomfortable. God’s grace. In God’s economy, I don’t have to do 10 good things to get a blessing. In fact, God showed His love for me that while I was still a sinner, making all the wrong choices. He sent His son Jesus – the greatest blessing of all. We are all under God’s grace and the students learn this in Bible and devotions. Why should my classroom practice paint a different picture? Relationships over transactions. When I rewarded good behavior with stickers or points, it felt very transactional: “If you do this, then you get that.” Establishing transactions or deals made me feel like a robot handing out either rewards or punishments when certain conditions are met. You can promise a game if students work quietly, but what if they don’t and a game might actually be just what they need to re-focus? Focusing on relationships will allow you this flexibility to see and do what is helpful for students. A false sense of entitlement and wrong motivation. “We worked quietly, Mrs Herweynen, we should play a game.” Or more heartbreaking, Didn’t you see me tidy up that corner without being asked? Can I get points for that? : Do we want students who do good in order to get something in return? The world already has enough of those type. Let’s not teach children to think that behaving responsibly is a debt to be paid. So there I was, confused and unsure of what to do next, but I knew that the Gospel message should be throughout all my classroom practices. God graciously led me to two articles from Smart Classroom Management, “Why You Shouldn’t Reward Students for Good Behavior” and “The Best Incentive You Could Ever Give.” These articles validated my concerns and articulated what I thought should be case: grace in behavior management. 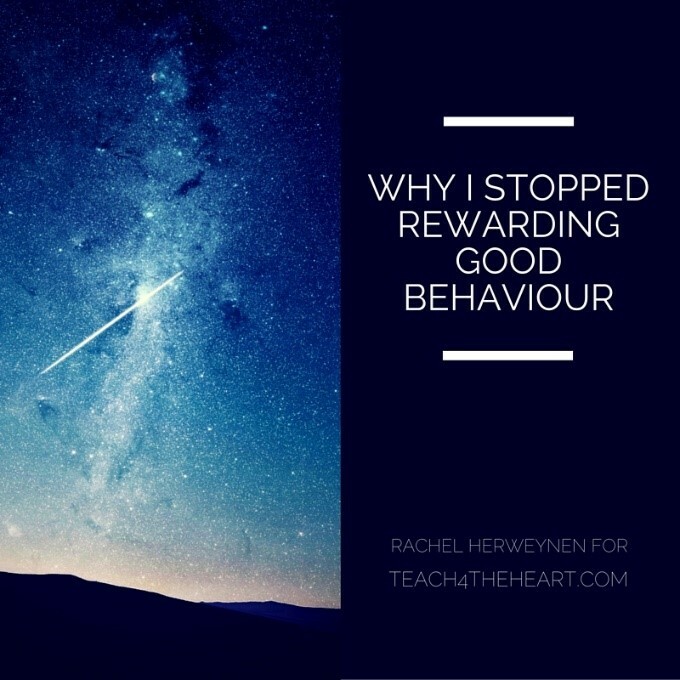 The rewards of good behavior can’t be bought. Behaving well allows students to learn as they listen, observe and engage in discussions. Good behavior also enables them to enjoy school more as they establish and maintain friendships. They are loved unconditionally. Students know that they do not have to earn my favor to be loved. This is only a small reflection of what God’s love is like but if it helps them understand their Heavenly Father a bit more, it is worthwhile. Now we play games in class “just because.” There is freedom in being able to enjoy each other’s presence. The best type of obedience is one inspired by love and gratefulness; the obedience that our Lord wants of us. Not forced, out of fear or out of wanting something in return. I pray that we may teach and model this loving obedience to our students through our classroom practices. Thank you so much for sharing your thoughts, Rachel. Now it’s your turn – What place do you think rewards do or don’t have in the classroom? Share your thoughts with a comment below. What if your school practices PBIS? From my brief look at PBIS it looks like what this article is talking about. PBIS isn’t about rewards. It is about positive support for good behavior. Rewards are an extrinsic thing whereas PBIS is trying to improve behavior through building intrinsic systems. Please correct me if I’ve misinterpreted PBIS. There is so much I agree with this post. Every time I try to do a behavioral incentive, it backfires for all the reasons above. Students who don’t behave for the right reasons will not behave when the incentives are withdrawn. Students need to have the opportunity to see the power of intrinsic reward. I’ve seen too much antisocial behavior outside of the classroom from students who behave excellently for rewards in the classroom. I’ve also had my fair share of students who could not care any less about rewards, but respond to kindness and love. On a side note: this is an example of how you can use a religious belief to enhance your teaching without teaching religion. If we all treated each other with God’s love, how much better would our classrooms be? God’s love is not only for those who worship. Thanks for sharing your thoughts and encouragement, Peter. This wasn’t an easy article to write as I know rewards are the norm. How have you managed the classroom without material rewards? It’s not an easy topic. I’m still trying to make my way through this topic. I know inside that love and support works better than rewards… in the long run. Rewards are much easier to implement, but only work short term. This seems to be true of everything worthwhile in life. Shortcuts don’t work. Now, how to manage a classroom without rewards? And do it well in middle school? I make small successes, but it’s a daily struggle. I do use praise, which I believe if used correctly leads to intrinsic strength. It is hard to praise when there is no apparent good behavior to praise. But when students do something good and it is noticed and I show my pleasure, they definitely respond in kind. At that point it needs to be pointed out to them explicitly. Not every time of course, but you have to show them to feel and recognize this good feeling over a job well done, or behavior well done. I agree with your thinking but the problem that I run across is all the other teachers who reward behavior make you look like the bad guy and they want to run and help them and whine about being asked to do anything in their own classroom. Just what I have observed. Yeah. The teacher that has no spouse or kids and lavishes her students with candy constantly is a favorite teacher at my school. But then, these same students seem to be only driven by extrinsic motivation. Many districts have strict policies about food rewards, yet it keeps happening. If you truly show your care and love for students, this will win in the long run. Ten years from now, they will remember with more fondness the teacher that cared, not the one that gave them unlimited candy.